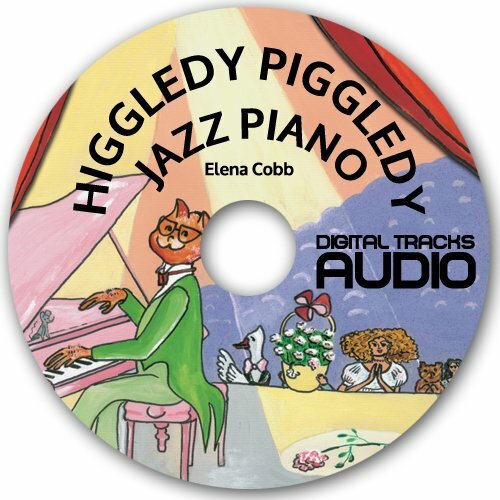 To make the tunes as accessible as possible for the beginners, I composed Higgledy Piggledy Jazz tunes in very simple keys of C Major or A minor, except for ‘Blues for Little People’ and ‘Polka Butterfly’, which are in D minor with one flat. 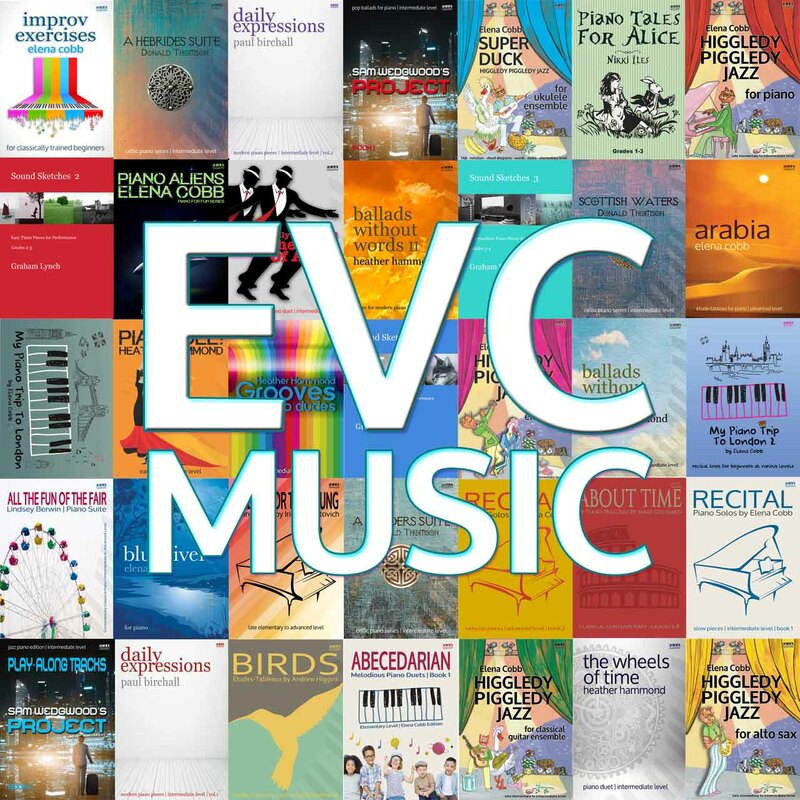 Most of the tunes are based on the idea of the 12-bar blues or the blues scale, although ‘Take Three’ is a jazz waltz and ‘Peony Pink’ is a crossover into the style of popular music in the 1950s.The printed music itself includes several new elements, which have been introduced specifically to help children and beginners learn and understand the key basics of piano playing as quickly as possible, particularly when they are practising on their own. These elements are outlined below. If you bought an earlier edition of Higgledy Piggledy Jazz, notation in twelve bar blues tunes will be printed in colour. If the book is printed in the traditional black ink, you will have an opportunity to create an activity by highlighting the changes in the left hand in different colours. This will assist in learning the structure of the twelve-bar blues itself. Pick three colours and go ahead – have some fun! There are ten tunes in the book, five of which (all in C major) either contain colour coding of chords or you can ask your student to highlight them. Use black to show C Major chords, green for F Major chords and red for G Major chords. The tunes which have twelve bar blues chords are, ‘Super Duck’, ‘I Ate All the Choc’late’, ’You Tell Me Why I Wait for Christmas?’, ‘Nerdy Cat’s Twist’, and ‘Higgledy Piggledy Jazz’. The chord letter (C, F or G) is printed in the appropriate colour above the beginning of bars where the chord change occurs, as a confirmation to the child of the chord they’re playing. This is to emulate how chord changes are traditionally shown in jazz music scores and to subliminally begin to build up a child’s theoretical knowledge of chord harmony structure. 1. Using the ‘Super Duck’ tune as an example, get your student to have a look at the first page of the music. If the notes are printed in colour, point that out and explain why that is, and what the colours mean. Make sure your pupil can find the appropriate chords on the piano. If the score is printed in black, created an activity by highlighting three different chords in left-hand part with different pencils. 2. Suggest your student first plays only the bars with C major (black) chords in, with the left hand, and practises those for a while. Then they should do the same with the F major chords and the G major chords. Point out that the chord letter is also shown at the beginning of the bar with each chord change to remind them. 3. Finally, they should try to play the whole tune, just with the left hand, linking together all the bars they have practised separately. Mention at this point that it’s important for them to try to be able to use their peripheral vision to look ahead to the next change in harmony so they are prepared for the next chord change. Explain how it is possible in this way to keep track of where they are the music when their eyes move down from the music to the keyboard to find the keys they need to play. 4. Once they have mastered the tune at a reasonable speed (still only with the left hand), they get to the exciting bit where they can try it out with the play-along track. It’s best, first of all, to choose the slow version with the jazz band (track 2) and practise that. Point out to them that the drummer is keeping the beat for them. 5. They can then start practising the right-hand notes by singing along to the play-along track and getting to learn the tune. (Most of the right-hand part is the same tune.) They can then graduate by trying to play it with the right hand. 6. Once they feel confident with both hands separately, they can put the two together and try to play the piece in slow tempo with the jazz band (track 3), eventually graduating to the fast tempo jazz band (track 4), or taking it easy and going for the fast tempo jazz band with the piano (track 1). 4. The ultimate challenge, the same tunes in fast tempo with only the jazz band, for your pupil to play along with as in a final performance (again, two bars of ‘clicks’ signal when to start playing). Learning to improvise on Twelve-Bar Blues could not be easier with this book. It contains all the steps needed to make a complete solo. Order today! Improv Exercises For Classically Trained Beginners is a 21st-century educational concept based on the belief that, in addition to the regular routine, classically orientated piano lessons should also include elements of improvisation. Although this book only deals with blues scale improvisation on the basic twelve-bar blues with only three chords, it will bring you to a firm understanding of how to structure your approach to improvisation. You will also be able to apply this new skill to another very popular element for playing jazz – comping, or as a classically trained pianist would say, accompanying a band without the score.And, one more thing . . . Less is more, remember that you are not paid by the note and there are no wrong notes in jazz. If it sounds good – keep it!